outcomes of the two mixed duopoly models. firm competes on price with a foreign private firm. complementary goods has been ignored. 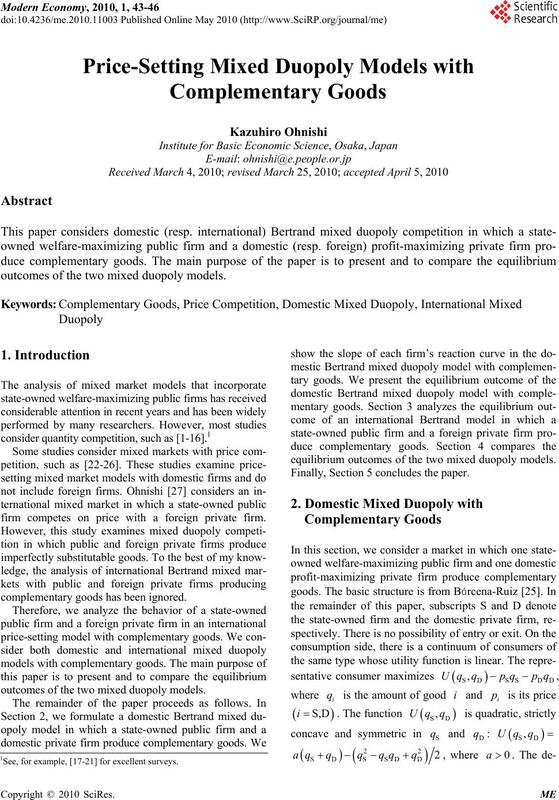 equilibrium outcomes of the two mixed duopoly models. Finally, Section 5 concludes the paper. 1See, for example, [17-21] for excellent surveys. functions are the same as those of the previous section. firm’s reaction curve is zero. duces an output such that price equals marginal cost. output is higher than the foreign private firm’s output. social welfare is equal to consumer surplus. opolies, respectively. We have the following results. are almost the same in both models. ; 3) ; and 4) . same as the proof of 2). Q.E.D. mixed duopoly competition with complementary goods. profit is negative in equilibrium. Vol. 16, No. 2, June 1992, pp. 226-240. Vol. 10, No. 4, December 1994, pp. 639-653.
ganization, Vol. 12, No. 3, September 1994, pp. 373-386.
ics, Vol. 29, No. 3, August 1996, pp. 737-743.
ganization, Vol. 11, No. 6, December 1996, pp. 853-860. 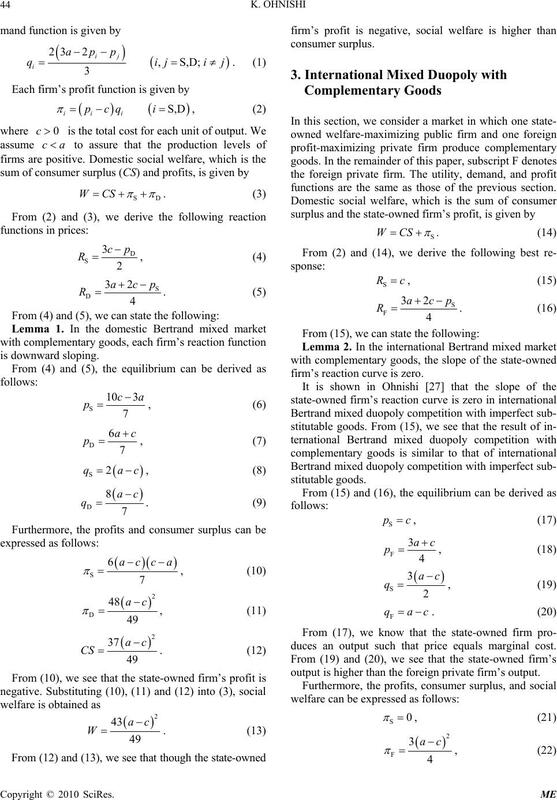 Economics Letters, Vol. 61, No. 2, November 1998, pp. Vol. 65, No. 2, April 1998, pp. 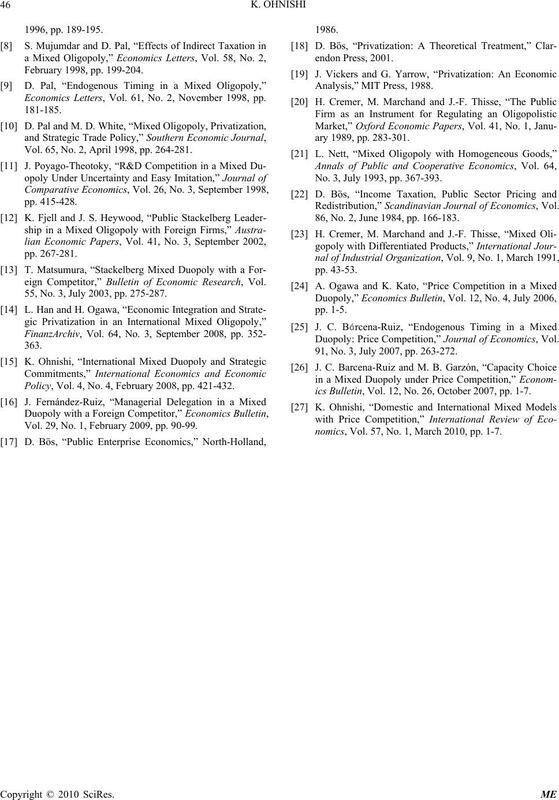 264-281.
eign Competitor,” Bulletin of Economic Research, Vol. 55, No. 3, July 2003, pp. 275-287. Policy, Vol. 4, No. 4, February 2008, pp. 421-432. Vol. 29, No. 1, February 2009, pp. 90-99. No. 3, July 1993, pp. 367-393. Redistribution,” Scandinavian Journal of Economics, Vol. 86, No. 2, June 1984, pp. 166-183. 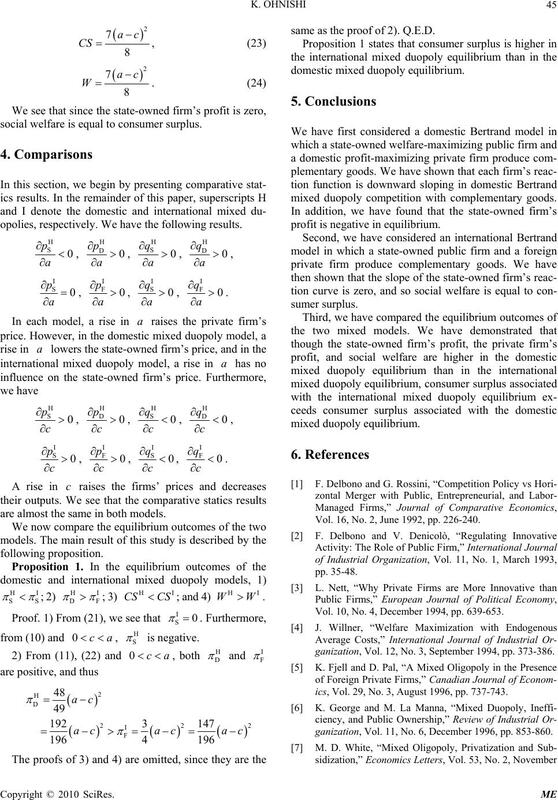 Duopoly: Price Competition,” Journal of Economics, Vol. 91, No. 3, July 2007, pp. 263-272.
ics Bulletin, Vol. 12, No. 26, October 2007, pp. 1-7.
nomics, Vol. 57, No. 1, March 2010, pp. 1-7.